These scans of xerox copies I made in c. 1980 may prove useful to some people. I recently found them among my research notes on Cartesian philosophers! 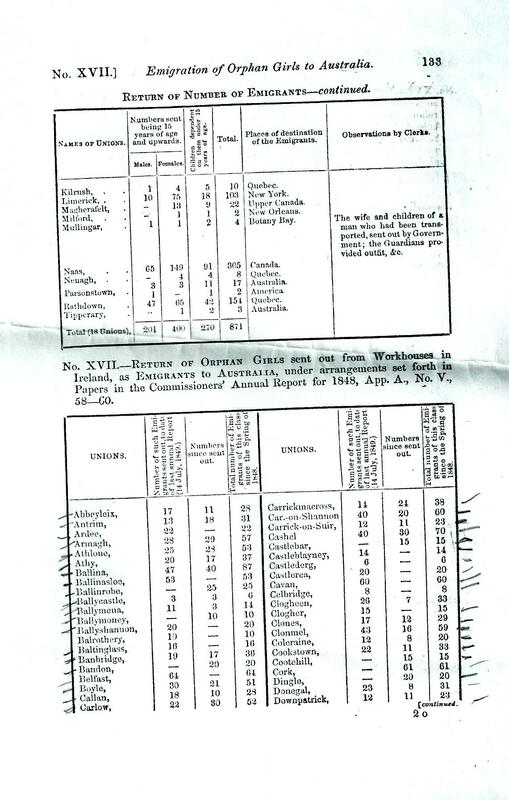 The first document is from the Select Committee of the House of Lords appointed to inquire into the operation of the Irish Poor Law, and the expediency of making any amendments to its enactments. Sixth Report. 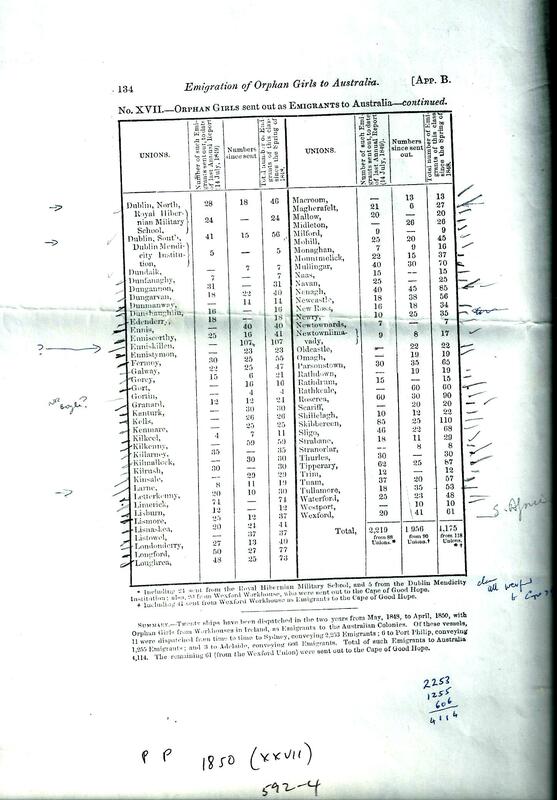 Appendix to Minutes of evidence, BPP HC 1849-49, vol 16, No. 507, pp.64-66. 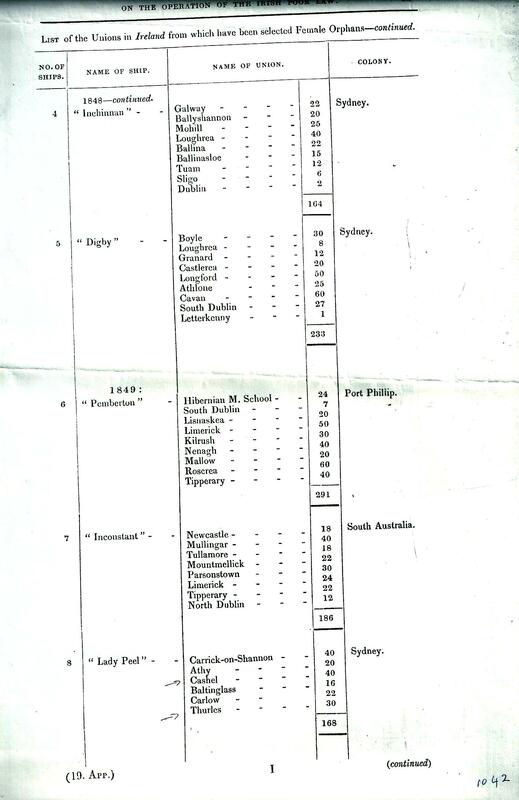 It tells us which Irish Poor Law Unions the orphans came from and which ship they traveled on. You will notice the misinformation regarding the first two vessels. 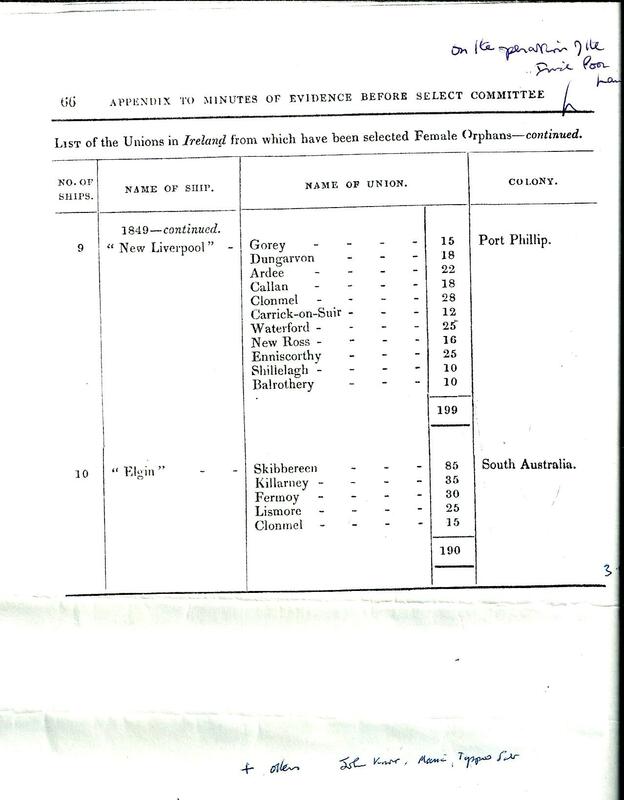 Unfortunately it does not include information about vessels that arrived later, in 1850. The next document is from BPP HC 1850 (XXVII) Commissioners for administering Laws for the Relief of the Poor in Ireland. Third Annual Report Appendix B pp.132-34 . You will notice this is where the figure 4114 female orphans comes from but my Barefoot, vols I and II has slightly more, about 4150, from memory. I assume the number in the database will be closer to the second figure. Please excuse my shonky scanning. Which reminds me…I’ve been hearing people say things like many of the orphans married more than once or the orphans often married more than once. Both ‘many’ and ‘often’ imply a measure. I was wondering has anyone actually counted or is it just a general impression, even an anecdotal one? Is it one in five, or 100 out of 300, or 400 out of 4000? And what percentage of marriages is each of these? I’m having a little trouble with my post on the ending of the Earl Grey scheme. Soon come. 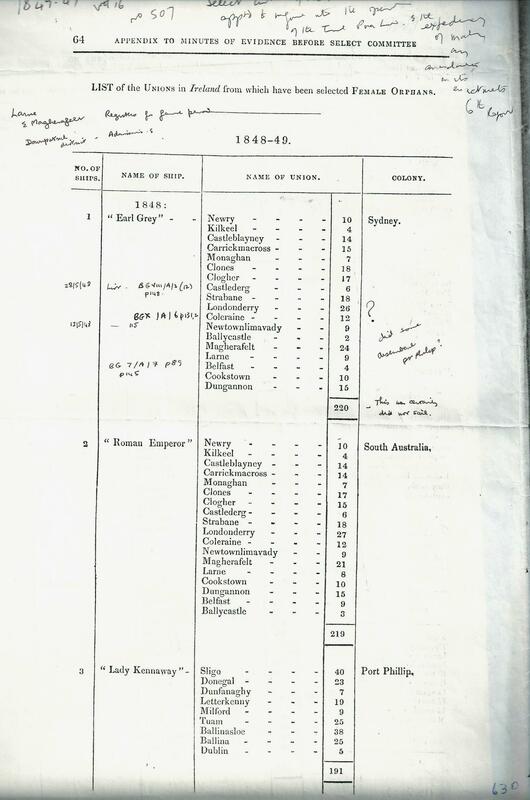 This entry was tagged British Parliamentary papers, Irish female emigration, orphan emigration returns. Bookmark the permalink. Thanks trevor your work is amazing!! THanks Kaye. It looks like there isn’t a lot specifically related to Margaret’s Irish background. You may have to imagine it for yourself. I hope there is something in my early blog posts, at least up to post seven or eight, that will help you do that. Maybe also find out what you can about Tipperary Town during the Famine? Best of luck with it. Had lunch with Brian D on Minday. He was in good form. Hope you flourish. The Watchorn Family Recollections of early Melbourne MS 11657 (record id: 21698155) is in the Australian Manuscripts Collection at the State Library of Victoria. 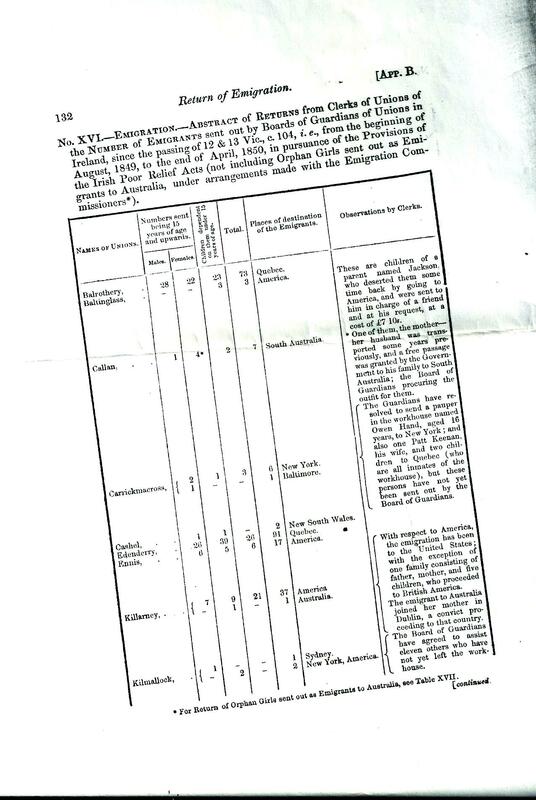 It includes a description of the voyage on the New Liverpool. There is also a description I think of the Thomas Arbuthnot voyage written by its surgeon used in the book with a title something like on “A decent set of girls”. I tried finding the book in the library so that I had the full details but could not. You should know what I’m talking about. If not email me and I will follow up. It has a reference to the “keening”.